The term “elbow dysplasia” encompasses a complex of orthopedic disorders involving the elbow joint of the dog. 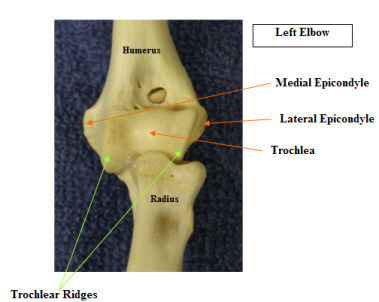 In order to differentiate among the different causes of “elbow dysplasia” a combination of diagnostic tools are used including physical examination, orthopedic examination, radiology, gait analysis, CT (computed tomography), MRI (magnetic resonance imaging), arthroscopy and exploratory joint surgery. Treatment options vary with the condition and will be discussed under the next section. 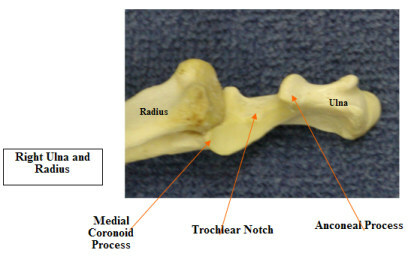 Ununited anconeal process – The anconeal process is a small piece of bone making up the back part of the trochlear notch where the humerus articulates with the ulna. In the pup this process has a separate ossification center and usually fuses with the ulna by 4-6 months of age. If this process does not occur the fragment of bone will eventually result in secondary arthritic changes in the elbow joint. Clinical signs are usually seen in young dogs with intermittent or persistent foreleg lameness. When sitting or standing the dog tends to pull the elbow in and toe-out in the foot. Pain can often be elicited in the elbow on extreme flexion and/or extension of the joint. Treatment is the surgical removal of the fragment or stabilization of the fragment with a bone screw. Ununited (Fragmented) coronoid process – This condition is also known as fragmented medial coronoid process. 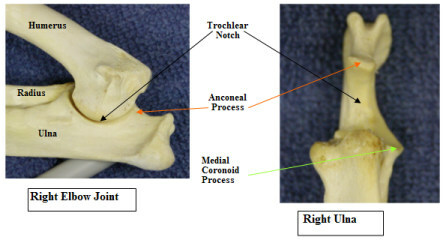 Here the front part of the trochlear notch is involved – a small fragment of the medial coronoid process of the ulna is free in the joint and leads to development of secondary arthritis. Signs are similar to ununited anconeal process. Treatment is surgical removal of the fragment. This condition can be very difficult to diagnose with radiology and often the diagnosis has to be based on CT or MRI procedures. Osteochondritis dissecans of the medial or lateral humeral condyle – Osteochondritis dissecans (OCD) is caused by a defect in joint cartilage formation and maintenance that can manifest in several joints including the elbow. Typically a defect occurs in the joint cartilage leading to a flap of cartilage being raised or even breaking off into the joint space (a joint mouse). The clinical signs are the same as for the other elbow joint problems but the diagnosis is usually based on radiographs. Treatment is surgical management with removal of the cartilage flap or the joint fragment and debridement of the underlying bone to stimulate fibrous scarring of the defect. Osteochondritis dissecans of the medial humeral trochlear ridge – The trochlea is the groove on the distal end of the humerus which articulates with the trochelar notch of the ulnar to form the hinge-like elbow joint. On either side of the trochlea are the trochlear ridges. Cartilage defects can occur on the ridges leading to lameness. Surgery involves removal of the cartilage flap and debridement of the underlying bone. Ununited medial epicondyle – This is an uncommon elbow condition characterized by detached calcified bodies just off the medial epicondyle of the humerus. They may or may not be associated with clinical signs such as lameness. Surgery may be needed in symptomatic cases.The above conditions are typically seen in young, rapidly growing, large breed dogs indicating that rapid growth rate may be a predisposing factor. These conditions may also be related to trauma, a hereditary predisposition or nutritional factors. Use of large breed puppy diets which are usually lower in protein and favor a slower growth rate. I try for a growth rate of 2-3 pounds a week. Avoid excessive weight in pups. Avoid trauma by supervising activity and exercise periods. Especially be careful with stairs, jumping up on or down from furniture, uncontrolled behavior, etc. Provide firm footing for puppies at all times. For those handlers training in agility I recommend only very low jumps, low obstacles, slow weave poles and emphasize keeping the puppy under control to avoid sharp turns, abrupt stops, etc. Flat work is OK and provides good foundation for later training on obstacles. Premature closure of the proximal radial physis. Premature closure of the distal radial physis. Diagnosis is based on the combination of physical examination and radiographs. The orientation of the abnormal limb often indicates the region where the growth plate abnormality is located. Various surgical repairs are described but most involve an osteotomy (cutting the bone and removing a small section of it) of the bone in which the growth plate has prematurely closed. This allows the normal bone to continue to grow in a normal manner. These problems are very often trauma related. Early diagnosis and treatment of elbow problems is very important to prevent lameness, premature arthritis and physical abnormalities in affected individuals. Consultation with a veterinary orthopedic surgeon is usually indicated for these problems. The earlier treatment is initiated the better.